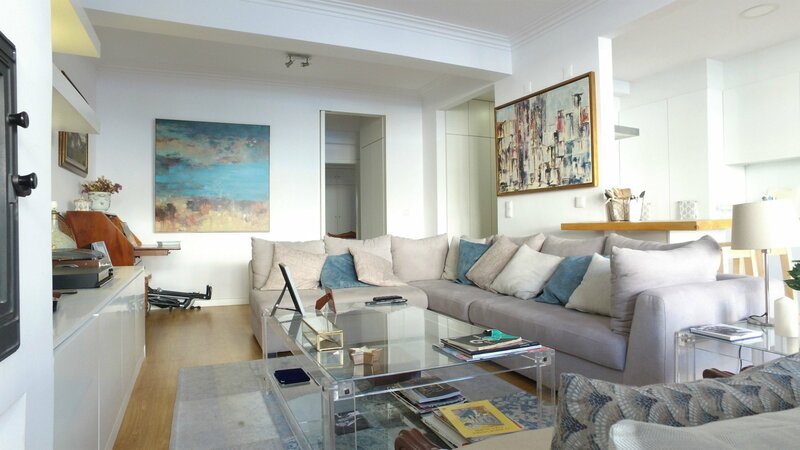 Superb, spacious 2 bedroom apartment, which has recently been refurbished to a very high standard, in an excellent residential location in Bairro do Rosaro, Cascais. This stunning property has bright and airy accommodation with ample natural light and the accommodation comprises inviting entrance hall, open plan lounge and dining area, 2 bathrooms and storage. It has high quality finishes and is immaculately presented. Portugal's capital city, Lisbon offers a blend of city living and traditional Portugal. Situated on the West coast of Portugal it is one of the best city/beach-combo destinations in Europe. A historic vibrant city with plenty of stories to tell and things to discover, you will never be short of things to do or see in Lisbon. The city is also famed for its seafood dishes such as Bacalhau (salted cod) and excellent local wines; visitors genuinely are spoilt for choice when it comes to places for eating and drinking in Lisbon. The flight time from London to Lisbon International Airport takes two and a half hours. The airport is located just 7 Km from the very centre of the city and has excellent transport links, so getting from the airport to the inner city is no issue. If you choose to drive to Portugal, the best ways to enter Lisbon are via the A1 and A2, which both have national and international connections along their course. Rarely too hot or cold, Lisbon is a year-round destination. The climate in Lisbon in the winter season is mild and sometimes rainy but warm and dry in the summer. Whether you are a fan of sport, adventure or prefer to bask in the sun's warmth, Lisbon is perfect. If the sun ever gets too much, there are plenty of cafes, bars and other spots to cool off in the shade. The Oceanário de Lisboa – Found at the Doca dos Olivais, Parque das Nações, The Oceanario de Lisboa is Trip Advisor's highest rated aquarium worldwide for both 2015 and 2017. The aquarium is home to four marine habitats that house 5 million litres of sea water and animals from all around the world. Calouste Gulbenkian Museum – One of Europe's leading fine art museums, the Gulbenkian Museum (as it is often referred to) has exhibits dating from 2000BC to the early 20th Century. Two of the most well known rooms are those containing Islamic and Oriental art. In these rooms, visitors can find tapestries, tiles, furniture and many more artefacts more from 16th -17th century Persia, Turkey, Syria and India. A Cevicheria – One of the most popular and acclaimed restaurants in the whole of Lisbon, here you can sample Portuguese and South American fare in a trendy but welcoming atmosphere. A Cevicheria does not take reservations so turn up when you like, and if you have to wait for a table, you can enjoy a glass of local wine on the tables outside. Why Buy Property in Lisbon? There are many reasons to buy property in Lisbon. The friendly and welcoming people, the city's beautiful architecture and endless list of things to do and places to eat often give the impression that living here would be expensive. However, the cost of living in Lisbon is comparably lower than most European capital cities. A good range of properties can be found throughout Lisbon. In the centre and the historic downtown district of Lisbon, you can expect to find mainly apartments and some houses. Outside of the city centre, villas, houses, apartment complexes and a variety of other properties are available. There are also plots of land for development available throughout Lisbon. Some of the most popular places to live in Lisbon include Cascais, Estoril, Sintra and of course Lisbon's city centre.